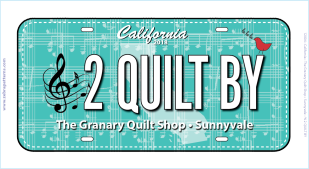 The Granary's 2018 Row by Row collectable license plate, "Music to Quilt By". We ship anywhere in the US and Canada for a flat $ 1.00 shipping fee. For international orders, please call us at (408) 735-9830.